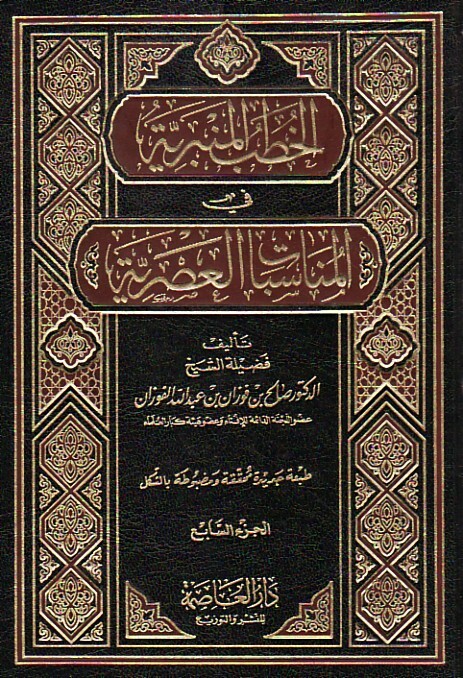 From the great scholars of our times, Shaykh Saalih bin Fawzaan bin Abdillaah al-Fawzaan (hafidhahullaahu ta’alaa). He is from the scholars of Usool, Fiqh, Aqeedah, Tawheed, Manhaj, Tafseer, Faraa’id and other than that from the affairs of connected to knowledge. He has some writings, which are in essence muhādharāt, i.e. sermons and admonitions directed towards the general Muslims so that they may benefit from that which the Messenger of Allaah (sallAllaahu alayhi wa sallam) use to admonish his Companions (radiAllaahu anhum) and the Ummah with. “Then (in the end) We save Our Messengers and those who believe! Thus it is incumbent upon Us to save the believers.” [Qur’aan 10:103]. My brothers and sisters, the one who calls upon Allaah, then Allaah (subhaanahu wa ta’alaa) responds to him, so long as that individual, my brothers and sisters, is an individual who does acts and deeds of righteousness in times of ease and likewise he calls upon Allaah in times of difficulty. So then Shaykh al-Fawzaan mentions, “And look on the other hand with regard to the affair of Fir’awn (the Pharaoh) who transgressed all bounds, ignoring Allaah (subhaanahu wa ta’alaa) and disregarding the remembrance of Allaah (subhaanahu wa ta’alaa) – and when he was admonished, he refused to accept that admonition. When the Prophet of Allaah Moosaa came to him and when the Prophet of Allaah Haaroon came to him, admonishing him, reminding him of Allaah with a word that was easy, simple, kind, compassionate; they were not harsh with him, he (Fir’wan) turned his back and he did not accept that admonition. So look at what happened to him! Ignoring all the remembrances of Allaah! So when his soul was called for at the point of death, what did he call out with? He called out saying, ‘Now I believe in Moosaa in that which he came with!’ He believes in the Lord of the Heavens and the Earth! But did that benefit him in that stage? It did not benefit him! So Allaah mentions with regard to this affair: ‘And now you believe whilst you refuse to believe before and you were one of the Mufisdeen (the ones who use to cause corruption and sin and transgression).’ But now you want to believe as you’re drowning? And there occurs the hadeeth that Jibreel (‘alayhis-salaam) came to the Messenger of Allaah (sallAllaahu ‘alayhi wa sallam) and he said, ‘Oh Muhammad! If only you had seen me as I grabbed the dirt in handfuls from the bottom of the sea and I stuffed it into the mouth of Fir’awn out of fear that the Mercy of Allaah may reach him!’ But by that time, the soul had already started leaving the throat and leaving Fir’awn. So now his claim and his desire to believe was too late because now has come to him certainty, the certainty of death, so now he realizes what is in store for him, so then he called upon Allaah (subhaanahu wa ta’alaa). But did that benefit him? The answer is no, it didn’t benefit him! So whomsoever remembers Allaah whilst he’s in a state of ease and good health, and he prepares himself with righteous actions to meet Allaah (subhaanahu wa ta’alaa), then Allaah remembers him and Allaah aids him in his times of hardship and Allaah is with him and Allaah protects him and Allaah gives him firmness and steadfastness upon Tawheed and upon the Sunnah of Allaah’s Messenger (alayhis-salaatu was-salaam). And even if he was to die during that hardship, then he would die whilst Allaah is pleased with him. As for the one who forgets Allaah, whilst being prosperous, at ease, in good health, and he is not prepared and ready to meet Allaah, if he was to die, then Allaah would leave him and Allaah would abandon him and Allaah will forget him when he is afflicted with hardships and calamities. And this means that Allaah will turn away from Him and will not show him concern, just as he did not show the Deen of Allaah any concern. May Allaah (subhaanahu wa ta’alaa) protect us and protect our Muslim communites and our families from this “ghafla“, this inattentiveness with regards to the dhikr of Allaah and with regard to righteous actions! There is a beautiful statement from some of the Salaf with regard to the knowledge we possess, my brothers and sisters, and how much of that knowledge we act upon. And we should ponder, every single one of you sitting here today, not excluding myself, that we have a certain amount of knowledge that Allaah (subhaanahu wa ta’alaa) has blessed us with. Then if we compare that amount of knowledge that Allaah (jalla wa ‘alaa) has blessed us with in comparison to how much of that knowledge we act upon, then you will recognize, my brothers and sisters, how deficient we are with regard to that which we know and that which we act upon. Maalik bin Dinaar (rahimahullaahu ta’aala) said: “If a servant seeks knowledge to act upon it, then it humbles him.” No doubt, true ‘ilm, my brothers and sisters, with a heart that has ikhlaas and is sincere to Allaah, when the knowledge enters that heart, then that person is humble, that he becomes modest, he does not become arrogant. And then he (Maalik bin Dinaar) mentioned: “And if he seeks knowledge without acting, it only increases him in arrogance and pride.” And this is the reality! Those individuals who gather around them ‘ilm and they memorize (which is good) and they seek knowledge (which is good); it is from the best of all of the deeds that an individual can do: to seek and pursue knowledge of Allaah and His Religion. But knowledge is to be acted upon, because the one who acts upon the knowledge, then he has given Zakaat upon the knowledge! He has paid that which is due upon the knowledge! So he acts upon it and Allaah blesses him and Allaah humbles him and Allaah makes him a Walee (friend) of Allaah (subhaanahu wa ta’alaa). As for the one who seeks knowledge, so he may compete with the scholars, so he may show his arrogance and his might so he may overpower others in the sittings and gatherings, and he does not act upon that which he has learned, then what will that knowledge do to him, except fill him up with arrogance and pride! And that’s what we find in the statement of az-Zuhree (rahimahullaahu ta’alaa), from the teachers of Maalik bin Anas, he mentioned: “Indeed, the people will never be pleased with a scholar who has knowledge, yet he does not act. And likewise, they will not be pleased with an individual who is continuous in acting, but he does not possess knowledge.” So we gather between the two, we gather between ‘ilm and ‘amal (knowledge and action) – and that distance between the knowledge you possess and the actions that you act upon, we try to reduce that gap! Not by reducing the knowledge! This is from traps of Shaytaan that he will say to you, “You might not act upon knowledge so stop seeking knowledge!” No! But rather you proceed and you continue seeking knowledge and you strengthen yourself in your actions and you turn to Allaah (subhaanahu wa ta’alaa) in that regard. “There were three people from those that came before you (meaning from Banee Israa’eel) and they set out upon a journey during the night and they reached a cave. Imagine this man, my brothers and sisters, all day he has been working, gathering provision, looking after his cattle, then he milks his cattle and then he returns and he presents the milk to his parents but they’re asleep – and he does not wish to wake them from their sleep. He has his wife and children around him who are hungry and he does not serve them but rather after all that long day in working, he waits there with the milk in hand, he does not go to sleep. Surely after a tiring day that he will be tired and would love to go to sleep but he waited due to the service of his parents, holding the milk in hand. And that’s why Shaykh Al-Albaanee (rahimahullaahu ta’alaa), commenting on this, he mentioned: “By Allaah! That the etiquette and the nobility of this type of individual hardly leaves any doubt that this individual must’ve been from the Prophets of Allaah due to service that he gave to his parents.” This type of service, my brothers and sisters, is hard to find, if at all find at our times. The other one said, “Oh Allaah! My uncle had a daughter and she was the person that I loved the most and I tried to persuade her to have sexual relations with me but she kept refusing up until a year came and she suffered from a year of famine. And then she came to me in desperation and I offered her one hundred and twenty Dinaars on the condition that she would comply with my desire and she would sleep with me. So she agreed. But when I was about to fulfil my desire she said, “Oh servant of Allaah, do not violate my chastity except by lawful means.” I felt ashamed and shy to commit the crime against her, so I left her alone and she was the most beloved and the most dearest of all people to me – and I left the gold coins with her. Oh Allaah! If I did that seeking Your Face alone, then release us from this situation we are in.” So the rock moved a little bit more but they were still unable to escape. Where is that piety now, my brothers and sisters?! Where is that sincerity in our times?! Where is that honesty?! That amaanah (trust) that is being lost on a daily basis between ourselves! Brother against brother! Sister against sister! Lack of trust! Lack of honour! Lack of common decency and civility! Something that even the non-Muslims recognise in some of our behaviour! Untrustworthiness! Not a person of his word! What times have we entered into, my brothers and sisters?! And then when the hardship comes, we say, “Where’s Allaah? Why didn’t Allaah answer me?” That’s what you find people say! Hasty in their supplications! Musta’jileen! Hasty and wanting the answer now! Yet, in times of ease, they didn’t call upon Allaah! Look at these three men! In times of ease, look what they did! In times of hardship, Allaah came to their aid! Trapped inside of a cave! How long would they have survived, without water, without drink, before Allaah (subhaanahu wa ta’alaa) would’ve taken their souls?! But they remembered, that we have some good deeds, we have compiled some good deeds in our life by way of which we can make tawassul (seek a means of nearness) and make waseelah (seek nearness) to Allaah, seek nearness to Allaah by way of those good deeds. So let us be, my brothers and sisters, from those individuals who pay attention to those affairs. That we are from those, as Shaykh al-Fawzaan mentions, that we are those individuals that are not destroyed, destroyed in this life and destroyed in the Hereafter due to the fact that we do not seek beneficial knowledge, due to the fact that we did not act upon the knowledge that we possessed. And Allaah saved the believers who were amongst them. Amongst who? Amongst the people of the past, that he mentions, he said, “Look at Nooh (‘alayhis-salaam), look at the people of ‘Aad, Thamood, how Allaah (subhaanahu wa ta’alaa) destroyed them for their not worshipping Allaah and for their crimes and sins! And then Allaah saved the believers who are amongst them! Not destroying a single one of them. And he destroyed the unbelievers, not leaving a single one of them!” Allaah saved the believers, not destroying a single one of them and Allaah destroyed the unbelievers, not leaving a single one of them! Fataqqullaah (fear Allaah and be dutiful) as Shaykh al-Fawzaan mentions, so fear Allaah, have taqwaa of Allaah! And then Shaykh al-Fawzaan concludes: And be steadfast upon your religion! In that you will find success and salvation and happiness in this life and the next life – and do not waste your deeds, do not drown in sins and disobedience and if you see those who do that, then do not envy them and do not desire their life that leads them to destruction and punishment! And when a calamity befalls them, they have lost their means for they do not remember Allaah in times of ease, but now, they want Allaah to help them in their times of difficulty. Let us not be from those individuals, my brothers and sisters! May Allaah protect us from forgetfulness and negligence! May Allaah protect us from being those who are lackadaisical with regard to acting upon the knowledge that we possess and may Allaah (subhaanahu wa ta’alaa) raise us in this world and raise us in the Afterlife amongst the Prophets, the Messengers, the truthful, the righteous, the pious and the true martyrs in the cause of Allaah. And all praise is due to Allaah, the Lord of the worlds and may the peace and blessings of Allaah be upon the Prophet, his Companions and followers. * Transcribed by brother Abu Abdur-Rahmaan Khalil Darwish – may Allaah reward him for this noble effort and place it in his scale of good deeds on the Day of Judgement.